great looks that you have put together. Awesome. They all give a little extra flair to their outfits. I like the Bermuda shorts tip. Your daughter is so talented. Love her drawings. Thanks, Michelle. I have 2 very artistic daughters. They get NONE of their ability from me! LOL! You pulled together a beautiful post! Please share with your daughter how much I love her sketches. Thank you so much for your support Cathy! 1Thanks for letting me feature you again and your post pointing people to this one. Your readers love you and all your looks! I’ve never felt comfortable in Bermuda’s but Shellie looks great in them. Fun ideas. I pinned your collage. Thanks, Rebecca! I’ve received quite a bit of traffic from Pinterest on this post! I love all of the looks! Everyone looks so chic! Thanks for the inspiration! These ladies inspire me- they all look great! I totally get that! LOL! Love these looks, Cathy! Your daughter’s illustrations are amazing! Thanks, Terri – we had fun working together! 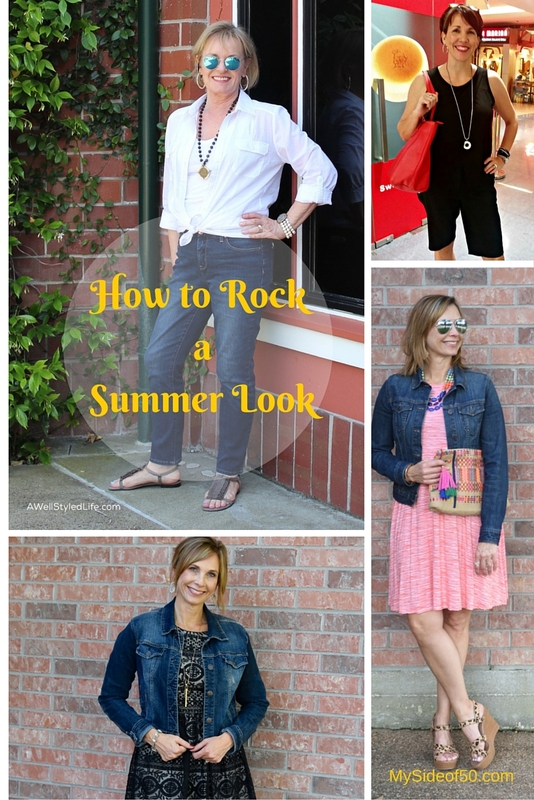 Fabulous summer looks & fabulous illustrations! Your daughter is very talented! Yes – Shelly did a great job styling it both ways. Jennifer always looks great. Always. In fact, I’ve bought stuff she’s worn on her blog. Seriously! I bought 3 of the Covered Perfectly tops she wore one time. They are fabulous! Fab post! I adore and follow all three of these gals! Dawn – so glad you liked the post. These ladies are fabulous! Denim jackets are so versatile! I never would have thought to put it over a cocktail dress like she did, but it works! Great looks. l.especially love the whit cotton blouse over jeans. Jennifer makes every look a classic! 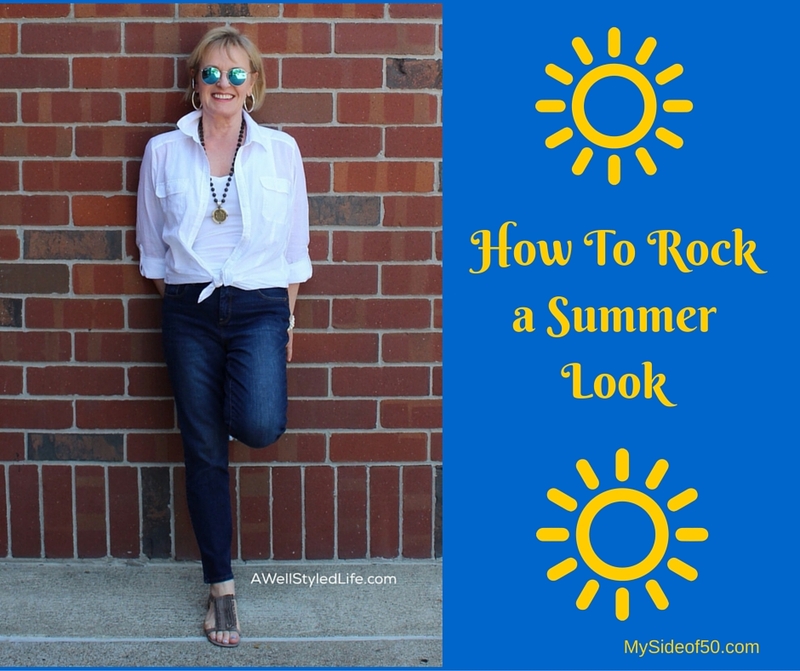 Love these ladies and these summer looks! Me too – they are so cute! Love all of these Cathy! You can’t beat a white shirt and jeans for a smart casual look and I love the black shorts and top. Pity it is winter here LOL:) although I’m saving money because I can’t go out and buy them! I know – aren’t they great! I learn so much from these ladies! They all look great and I love Bermuda shorts. My favorite though is the one you wore. The little black dress with the denim jacket. That is such a cute look. Well, that is actually Shelly Janac from thequeeninbetween.com. She is super cute. I am flattered that you thought that was me. And she does have the cutest looks! I know – we can be stylish and edgy in “age appropriate” ways! I am having so much fun in the Megaphone group! I didn’t realize you were a fashion blogger. I have so many jean jackets. I don’t know why I opt for sweaters instead. Well, I’m not really a fashion blogger, but I love reading fashion blogs. And the 2 posts that have featured fashion have been very popular! Glad you like the Megaphone group. Lots of good writers! Thanks so much for featuring me, Cathy! Those are great tips on wearing shorts. I thought so too! I had a couple of my shorts tapered and they look so much better. Thanks for letting me include you again. Everyone loves your look! I love all three of those garments, they’re classic and easy to style. I especially like Bermuda shorts. They can look positively elegant. Thanks for the post! 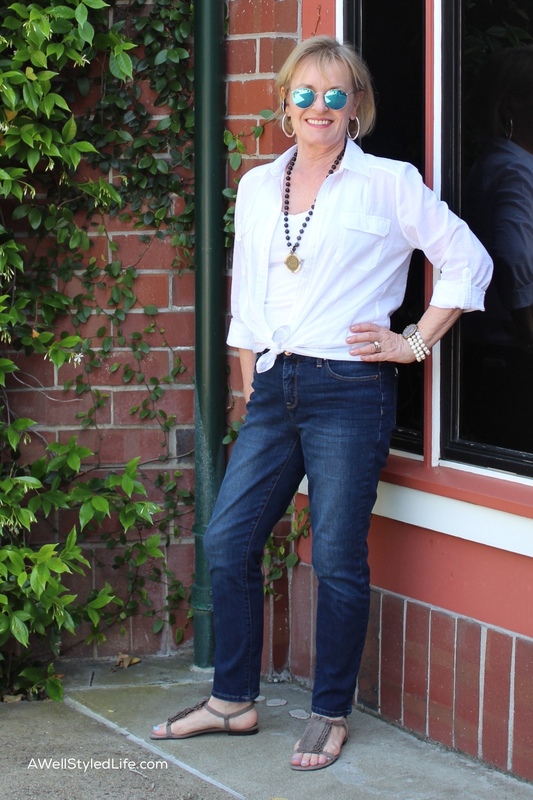 Anita – I had some shorts that didn’t look quite right and had my tailor taper them. Made a world of difference! No wonder you are into fashion with your talented lovely daughter, lovely sketches. I loved reading your post even though I am not into fashion very much. Shellie always looks so good. I love the drawings. i don’t so shorts, but am happy that the denim jacket is a staple! Every look is so different! These bloggers always rock it! Love these tips! All of them look stylish but they look great. It’s hard to know how to dress for your body style and not look as if we are trying to hard to look young. These ladies have pulled it off wonderfully. Allison’s illustrations are incredible! Your daughter’s are so talented, like their mother! Love these looks. Great ways to look great even when we get older. Your daughter is very talented. Beverly – glad you liked the post! I think these ladies are fabulous! My daughter included! I love a jean jacket…a closet staple. These are some great looks for summer and appreciate you compiling them. Lynn – I love a denim jacket too. I haven’t found one for me that fits just right yet. Thanks for reading and commenting on my post! Congratulations Cathy, your post was among the most clicked on the Bloggers Pit Stop #28. Look for a feature on Friday. Kathleen – I am so excited that I was featured. I was on an Alaskan cruise last week, so am just now getting back to looking at the comments. Will be back at the Pit Stop this week! What great suggestions. I really like the first outfit as I also have a muffin top and its getting bigger by the day! Cathy I also like the shorts outfit that Shellie is wearing, she can put off anything and looks like a million bucks. I know – Shellie always looks gorgeous. And the muffin – top – don’t get me started. It looks more like a bundt cake on me! All gorgeous ladies who always me inspire me to think outside the fashion box while still being true to myself! These gals have fabulous style and are absolutely to be admired! Great post! So fun! They all look great! I have to say the sketches are a amazing. Your daughter is super talented! Ilka – Allison has always been a talented artist. I am thrilled that she is pursuing her passion. Glad you like them. These are all looks that I can embrace as an over 50’s girl. Celeste – had no idea you were an “over 50’s” girl! Glad you enjoyed them! Thanks, Sarah. They make casual look pretty classy! Love these ideas! I didn’t know that tying a shirt hides the midlife roll. Glad to know that because the look is adorable! Sharing on Facebook. Glad you were inspired by Glenda’s fabulous looks! I really love the chic dresses paired with the casual denim jackets! I adore denim and it goes really with everything and can be combined so well! Lovely outfits Cathy! I like those too – would never have thought of that if I had not seen it on her blog! All of these outfits look fabulous! I would love to have a few of these for myself. I know – I wish these ladies would come and shop for me! I love all these looks for all of us women in midlife. Me too! Lots of great ideas here! These are all great looks! Like the tios for hiding muffin tops, and the bermuda shorts are just the right length for me. I dont wesr dresses unless i have to but these look so cute with the denim jackets. Your daughters very talented, love the drawings. Thanks, Linda. I have 2 artistic daughters that didn’t get a lick of their talent from me! I am loving Allison’s fashion illustrations and that she is pursuing her passion. I don’t wear dresses either – I am a different size on top and bottom. But I LOVE these looks! Gina – I would never have thought of putting a jean jacket over that fancy cocktail dress, but it looks so cute. That’s why I read these fashion blogs. I get so many great ideas! Hi I am Ada. So glad I found your blog. I love Shellie’s. You did the best classic way of styling the classic white button-down shirt. Welcome by and linkup with me beautiful. I run a linlup on Thursdays. I would love to have you. Thank you! Thanks for the invitation. Shellie’s was one of the first blogs I started reading when I started blogging and I love hers. I’ve learned so much from her. Love the denim jacket look! Michelle – I’m with you – I love how Shelley styled that denim jacket! Great looks and it is funny, I bought my first 2 pairs of Bermuda shorts today. I haven’t worn them in years. I actually bought them in “jeggings”! I had seen someone in them and they looked good. Thanks for all the ideas. Great looks. I can’t wear shorts or capri because I am so short and have junk in my trunk I end of looking more squat and even shorter if that is possible, but I love all the other looks. Haralee – those ladies showed something fun for everybody!